Fear of a new global war — a war with nuclear, chemical, or biological weapons — has almost never been higher. The bellicosity and threats emanating from Donald Trump and Kim Jong-un have already created a noxious environment of dread and anxiety. What does that fear look like? And sound like? 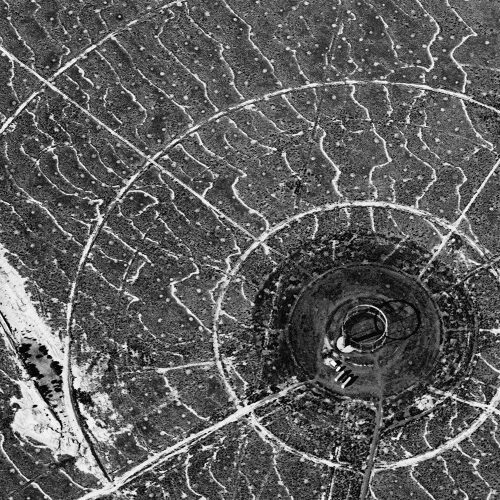 Like KYDOIMOS: The Din of Battle, a hypnotic and beautifully surreal 30-minute film that synchronizes aerial photographs of a U.S. military testing ground in Utah. Composer Chris Kallmyer created the music that accompanies David Maisel’s tsunami of curated images — all 50,000 of them, racing across the screen like microbiology slides or spotlight grids where military personnel detonate biological and chemical agents …on the earth below.